Description: Clip art photograph of two modified Standard Missile-2 (SM-2) Block IV interceptors are launched Thursday, June 5, 2008 from the guided-missile cruiser USS Lake Erie (CG 70) during a Missile Defense Agency test to intercept a short-range ballistic missile target. The missiles intercepted the target approximately 12 miles above the Pacific Ocean 100 miles west of Kauai, Hawaii on the Pacific Missile Range Facility. This was the second successful intercept in two attempts of the sea-based terminal capability and the fourteenth overall successful test of the Aegis Ballistic Missile Defense Program. 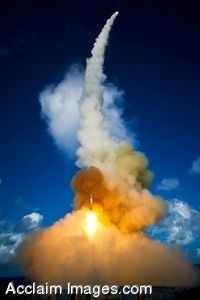 U.S. Navy photo by the Missile Defense Agency. Clipart photograph by Department of Defense Public Domain.